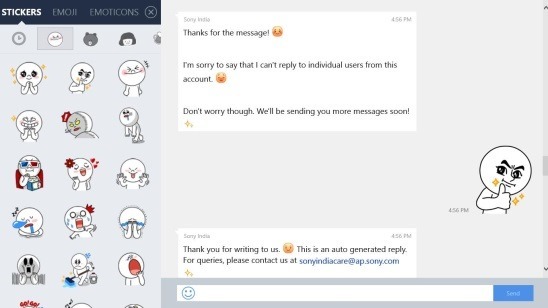 Line App for Windows 8 is a free text and voice chat app that lets you add cool stickers, emoticons, and emojis to your chat, to make it more exciting. It’s also available for smartphones and is quite popular in that version. 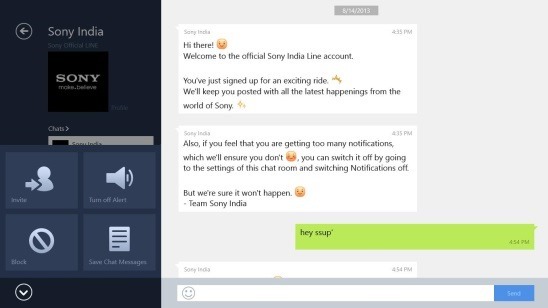 This version of the LINE app is designed specially for Windows platform, to enable users to have an exciting chatting experience on their Windows device (provided that they have LINE installed on their smartphones). As it’s a client app, you can do almost everything with this app that you do with the Line App for smartphones. You can chat with your Line friends, and send unlimited cute funny stickers, emoji, and emoticons to them. Along with that, you can also send photos, videos, voice messages to your friends. 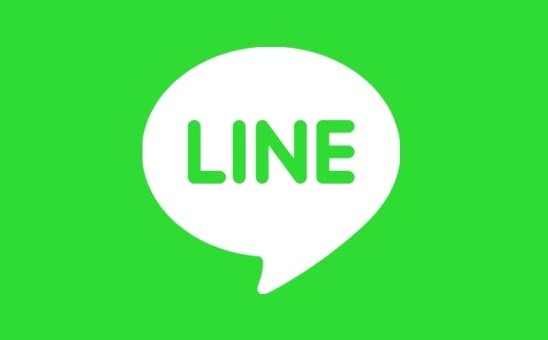 For the people who don’t know what LINE is, well LINE is an instant messaging application with which you can send images, audios, video media messages, and make free VoIP calls. Originally developed for smartphones, later it expanded to desktop computers as well. You can also search for friends, add new friends, view profiles, and create groups using the app. The app automatically add other LINE users to your LINE’s friend list whose contact numbers are saved in your phone-book. This free LINE app for Windows 8 is present under Social Category in Windows Store. The first requisite of the app is, you need to have a registered email id. The steps are bit tricky and you can refer the help given on the website to see how to register your email id. This free Line app for Windows 8 is a very well-made client app of the original. The interface is very fine and looks just like the mobile app’s interface. After logging with you registered email id, you’ll get the Main Screen of the app, which will show you all the friends, the groups that you made, and your previous chats. Clicking on any friend on this screen, opens up the Chat Screen, where you can chat with that particular friend. One thing good about the app is that, it saves your chat history along with date and time. So you can go back anytime and recall your chats. Everything which lies on the Main Screen is precise, the contacts are shown in big enough tiles. Like said before, you can send various funny and cute looking emoticons, emojis, and stickers along with text chats. Plus you can also send pictures, videos, and audio messages within the chat. If you want to invite more friends in the same chat, then you can do that by clicking on the Up Arrow Button on the bottom left corner in the chat screen. Using the same button you can also block a friend, set message alerts off, and save chat messages in .txt form. From the Main screen itself, if you make a right click then you’ll get the flyout containing buttons to Create a Chatroom, Make a Group, and Search by ID (which lets you search for LINE users, besides your friends). Excellent app as the LINE app for Windows 8. Send unlimited funny emoticon, emoji, and stickers along with text chats. Send pictures, videos, and audio messages for free. Options to create groups, chatrooms, invite friends to chats, and view profiles. Same interface as the mobile app has. 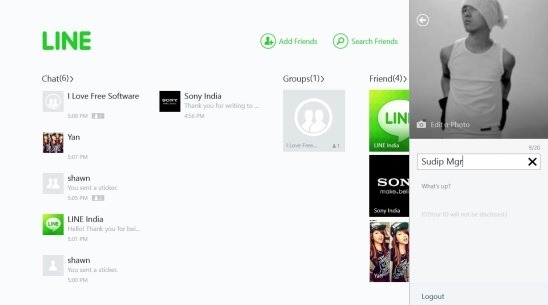 Line app for Windows 8 is an excellent client app of the original. It brings the whole fun and easy chatting experience, which you get on the mobile version of LINE, on your desktop. This desktop version is as good as the mobile version is. It completely does what it advertises. The only hitch about the app is the email registering process. Besides that everything work well, and the app is available all for free.